Easterbrook on the magnitude of Greenland GISP2 ice core data | Watts Up With That? The GISP2 Greenland ice core has proven to be a great source of climatic data from the geologic past. Ancient temperatures can be measured using oxygen isotopes in the ice and ages can be determined from annual dust accumulation layers in the ice. The oxygen isotope ratios of thousands of ice core samples were measured by Minze Stuiver and Peter Grootes at the University of Washington (1993, 1999) and these data have become a world standard. where δ18O is the of ratio 18O/16O expressed in per mil (0/00) units. The age of each sample is accurately known from annual dust layers in the ice core. The top of the core is 1987. The δ18O data clearly show remarkable swings in climate over the past 100,000 years. In just the past 500 years, Greenland warming/cooling temperatures fluctuated back and forth about 40 times, with changes every 25-30 years (27 years on the average). None of these changes could have been caused by changes in atmospheric CO2 because they predate the large CO2 emissions that began about 1945. Nor can the warming of 1915 to 1945 be related to CO2, because it pre-dates the soaring emissions after 1945. Thirty years of global cooling (1945 to 1977) occurred during the big post-1945 increase in CO2. But what about the magnitude and rates of climates change? How do past temperature oscillations compare with recent global warming (1977-1998) or with warming periods over the past millennia. The answer to the question of magnitude and rates of climate change can be found in the δ18O and borehole temperature data. Temperature changes in the GISP2 core over the past 25,000 years are shown in Figure 1 (from Cuffy and Clow, 1997). The temperature curve in Figure 1 is a portion of their original curve. I’ve added color to make it easier to read. The horizontal axis is time and the vertical axis is temperature based on the ice core δ18O and borehole temperature data. Details are discussed in their paper. Places where the curve becomes nearly vertical signify times of very rapid temperature change. Keep in mind that these are temperatures in Greenland, not global temperatures. However, correlation of the ice core temperatures with world-wide glacial fluctuations and correlation of modern Greenland temperatures with global temperatures confirms that the ice core record does indeed follow global temperature trends and is an excellent proxy for global changes. For example, the portions of the curve from about 25,000 to 15,000 represent the last Ice Age (the Pleistocene) when huge ice sheets thousands of feet thick covered North America, northern Europe, and northern Russia and alpine glaciers readvanced far downvalley. So let’s see just how the magnitude and rates of change of modern global warming/cooling compare to warming/cooling events over the past 25,000 years. We can compare the warming and cooling in the past century to approximate 100 year periods in the past 25,000 years. The scale of the curve doesn’t allow enough accuracy to pick out exactly 100 year episodes directly from the curve, but that can be done from the annual dust layers in ice core data. Thus, not all of the periods noted here are exactly 100 years. Some are slightly more, some are slightly less, but they are close enough to allow comparison of magnitude and rates with the past century. Temperature changes recorded in the GISP2 ice core from the Greenland Ice Sheet (Figure 1) (Cuffy and Clow, 1997) show that the global warming experienced during the past century pales into insignificance when compared to the magnitude of profound climate reversals over the past 25,000 years. In addition, small temperature changes of up to a degree or so, similar to those observed in the 20th century record, occur persistently throughout the ancient climate record. Figure 1. 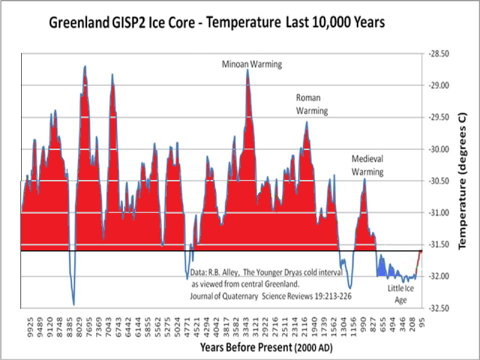 Greenland temperatures over the past 25,000 years recorded in the GISP 2 ice core. Strong, abrupt warming is shown by nearly vertical rise of temperatures, strong cooling by nearly vertical drop of temperatures (Modified from Cuffy and Clow, 1997). Figure 2 shows comparisons of the largest magnitudes of warming/cooling events per century over the past 25,000 years. At least three warming events were 20 to 24 times the magnitude of warming over the past century and four were 6 to 9 times the magnitude of warming over the past century. The magnitude of the only modern warming which might possibly have been caused by CO2. (1978-1998) is insignificant compared to the earlier periods of warming. Figure 2. Magnitudes of the largest warming/cooling events over the past 25,000 years. Temperatures on the vertical axis are rise or fall of temperatures in about a century. Each column represents the rise or fall of temperature shown on Figure 1. Event number 1 is about 24,000years ago and event number 15 is about 11,000 years old. The sudden warming about 15,000 years ago caused massive melting of these ice sheets at an unprecedented rate. The abrupt cooling that occurred from 12,700 to 11,500 years ago is known as the Younger Dryas cold period, which was responsible for readvance of the ice sheets and alpine glaciers. The end of the Younger Dryas cold period warmed by 9°F ( 5°C) over 30-40 years and as much as 14°F (8°C) over 40 years. Some of the more remarkable sudden climatic warming periods are shown listed below (refer also to Figure 1). Numbers correspond to the temperature curves on Figure 5. 1. About 24,000 years ago, while the world was still in the grip of the last Ice Age and huge continental glaciers covered large areas, a sudden warming of about 20°F occurred. Shortly thereafter, temperatures dropped abruptly about 11°F. Temperatures then remained cold for several thousand years but oscillated between about 5°F warmer and cooler. 2. About 15,000 years ago, a sudden, intense, climatic warming of about 21°F (~12° C;) caused dramatic melting of the large ice sheets that covered Canada and the northern U.S., all of Scandinavia, and much of northern Europe and Russia. 3. A few centuries later, temperatures again plummeted about 20° F (~11°C) and glaciers readvanced. 4. About 14,000 years ago, global temperatures once again rose rapidly, about 8° F (~4.5°C), and glaciers receded. 4. About 13,400 years ago, global temperatures plunged again, about 14° F (~8°C) and glaciers readvanced. 5. About 13,200 years ago, global temperatures increased rapidly, 9° F (~5°C), and glaciers receded. 6. 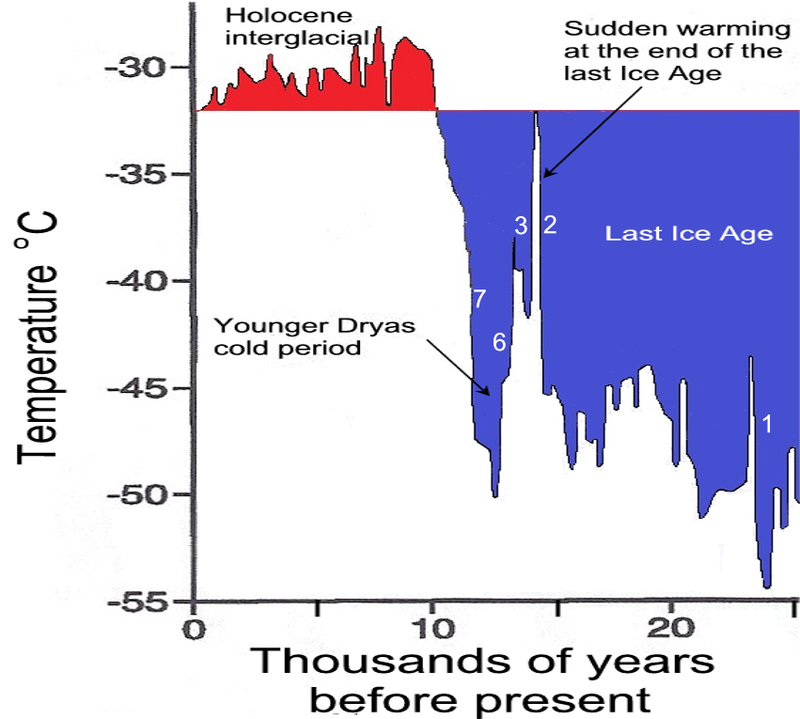 12,700 yrs ago global temperatures plunged sharply, 14° F (~8°C) and a 1300 year cold period, the Younger Dryas, began. 7. After 1300 years of cold climate, global temperatures rose sharply, about 21° F (~12° C), 11,500 years ago, marking the end of the Younger Dryas cold period and the end of the Pleistocene Ice Age. 8,200 years ago, the post-Ice Age interglacial warm period was interrupted by a sudden global cooling that lasted for a few centuries (Fig. 3). During this time, alpine glaciers advanced and built moraines. The warming that followed the cool period was also abrupt. Neither the abrupt climatic cooling nor the warming that followed was preceded by atmospheric CO2 changes. Figure 3. The 8200 year B.P. sudden climate change, recorded in oxygen isotope ratios in the GISP2 ice core, lasted about 200 years. Prior to the founding of the Roman Empire, Egyptians records show a cool climatic period from about 750 to 450 B.C. and the Romans wrote that the Tiber River froze and snow remained on the ground for long periods (Singer and Avery, 2007). After 100 B.C., Romans wrote of grapes and olives growing farther north in Italy than had been previously possible and of little snow or ice (Singer and Avery, 2007). The Dark Ages were characterized by marked cooling. A particularly puzzling event apparently occurred in 540 A.D. when tree rings suggest greatly retarded growth, the sun appeared dimmed for more than a year, temperatures dropped in Ireland, Great Britain, Siberia, North and South America, fruit didn’t ripen, and snow fell in the summer in southern Europe (Baillie in Singer and Avery, 2007). In 800 A.D., the Black Sea froze and in 829 A.D. the Nile River froze (Oliver, 1973). The Medieval Warm Period (MWP) was a time of warm climate from about 900–1300 AD when global temperatures were apparently somewhat warmer than at present. Its effects were particularly evident in Europe where grain crops flourished, alpine tree lines rose, many new cities arose, and the population more than doubled. The Vikings took advantage of the climatic amelioration to colonize Greenland, and wine grapes were grown as far north as England where growing grapes is now not feasible and about 500 km north of present vineyards in France and Germany. Grapes are presently grown in Germany up to elevations of about 560 meters, but from about 1100 to 1300 A.D., vineyards extended up to 780 meters, implying temperatures warmer by about 1.0 to 1.4° C (Oliver, 1973, Tkachuck, 1983). Wheat and oats were grown around Trondheim, Norway, suggesting climates about one degree C warmer than present (Fagan, 2007). The Vikings colonized southern Greenland in 985 AD during the Medieval Warm Period when milder climates allowed favorable open-ocean conditions for navigation and fishing. This was “close to the maximum Medieval warming recorded in the GISP2 ice core at 975 AD (Stuiver et al., 1995). Elsewhere in the world, prolonged droughts affected the southwestern United States and Alaska warmed. Sediments in Lake Nakatsuna in central Japan record warmer temperatures. Sea surface temperatures in the Sargasso Sea were approximately 1°C warmer than today and the climate in equatorial east Africa was drier from 1000–1270 AD. An ice core from the eastern Antarctic Peninsula shows warmer temperatures during this period. At the end of the Medieval Warm Period, ~1230 AD, temperatures dropped ~4°C (~7° F) in ~20 years and the cold period that followed is known as the Little Ice Age. The colder climate that ensued for several centuries was devastating (see e.g., Grove, 1988, 2004; Singer and Avery, 2007; Fagan, 2000). Temperatures of the cold winters and cool, rainy summers were too low for growing of cereal crops, resulting in widespread famine and disease. When temperatures declined during the 30–year cool period from the late 1940’s to 1977, some climatologists and meteorologists predicted a return to a new Little Ice Age. Glaciers expanded worldwide (see e.g., Grove, 1988, 2004; Singer and Avery, 2007). Glaciers in Greenland advanced and pack-ice extended southward in the North Atlantic in the 13th century. The population of Europe had become dependent on cereal grains as a food supply during the Medieval Warm Period and when the colder climate, early snows, violent storms, and recurrent flooding swept Europe, massive crop failures occurred. Three years of torrential rains that began in 1315 led to the Great Famine of 1315-1317. The Thames River in London froze over, the growing season was significantly shortened, crops failed repeatedly, and wine production dropped sharply (Fagan, 2000; Singer and Avery, 2007). Winters during the Little Ice Age were bitterly cold in many parts of the world. Advance of glaciers in the Swiss Alps in the mid–17th century gradually encroached on farms and buried entire villages. The Thames River and canals and rivers of the Netherlands frequently froze over during the winter. New York Harbor froze in the winter of 1780 and people could walk from Manhattan to Staten Island. Sea ice surrounding Iceland extended for miles in every direction, closing many harbors. The population of Iceland decreased by half and the Viking colonies in Greenland died out in the 1400s because they could no longer grow enough food there. In parts of China, warm weather crops that had been grown for centuries were abandoned. In North America, early European settlers experienced exceptionally severe winters. If CO2 is indeed the cause of global warming, then global temperatures should mirror the rise in CO2. For the past 1000 years, atmospheric CO2 levels remained fairly constant at about 280 ppm (parts per million). Atmospheric CO2 concentrations began to rise during the industrial revolution early in the 20th century but did not exceed about 300 ppm. The climatic warming that occurred between about 1915 and 1945 was not accompanied by significant rise in CO2. In 1945, CO2 emission began to rise sharply and by 1980 atmospheric CO2. had risen to just under 340 ppm. During this time, however, global temperatures fell about 0.9°F (0.5° C) in the Northern Hemisphere and about 0.4°F (0.2° C) globally. Global temperatures suddenly reversed during the Great Climate Shift of 1977 when the Pacific Ocean switched from its cool mode to its warm mode with no change in the rate of CO2 increase. The 1977–1998 warm cycle ended in 1999 and a new cool cycle began. If CO2 is the cause of global warming, why did temperatures rise for 30 years (1915-1945) with no significant increase in CO2? Why did temperatures fall for 30 years (1945-1977) while CO2 was sharply accelerating? Logic dictates that this anomalous cooling cycle during accelerating CO2 levels must mean either (1) rising CO2 is not the cause of global warming or (2) some process other than rising CO2 is capable of strongly overriding its effect on global atmospheric warming. Temperature patterns since the Little Ice Age (~1300 to 1860 A.D.) show a very similar pattern; 25–30 year–long periods of alternating warm and cool temperatures during overall warming from the Little Ice Age low. These temperature fluctuations took place well before any significant effect of anthropogenic atmospheric CO2. Temperature changes recorded in the GISP2 ice core from the Greenland Ice Sheet show that the magnitude of global warming experienced during the past century is insignificant compared to the magnitude of the profound natural climate reversals over the past 25,000 years, which preceded any significant rise of atmospheric CO2. If so many much more intense periods of warming occurred naturally in the past without increase in CO2, why should the mere coincidence of a small period of low magnitude warming this century be blamed on CO2? I presume the question in the conclusion is rhetorical. The real answer is that it shouldn’t be. The actual answer is quite different and very sad. This is a really excellent post, and puts our current warming into a historical perspective. It is a quirk of history that we are now in a warming period instead of a cooling period. The only “thing” which has changed through the course of time is the conscience of man. We are, we create, we consume, therefore, we induce change. We have too many people studying small insignificant problems/we don’t have enough large problems to solve. Understanding change/impact is one thing, assuming the sky is falling before understanding the problems in general is another. Which is too bad because I really like the climatic tie-ins to actual and recorded history. I seem to have heard this before. I enjoyed the article, thanks. But this will come as news to the English wine industry – the south of England currently has many vineyards. There’s no scientifically testable scientific answer to that question, Doc. I suspect it has to do with human gullibility and desire for certainty. Promoters of warming based on anthropogenic CO2 exploit that gullibility and desire. Why no graph for the Late Holocene period? You seem to switch from real data to historical prose. Many thanks for that. Not that it will make any difference to the true believers in Anthropogenic Global Warming for whom ‘science’ is always on their side. Isn’t it a stretch to present Greenland ice cap temperature as global temperature? It’s also interesting to see the 10Be data from GISP2. I’m going to try to insert the image here (ripped quickly from XL). And I’ll have the link below that if the image doesn’t show up. The x axis is years (0 is today). The Y axis is 10^3 10Be/g of ice. You can see the Younger Dryas signal here. It is not clearly seen in the antarctic cores. Also, the LIA 10Be values are very low compared to those from the Ice Age. I don’t see how a ‘quiet’ sun could be the only modulator of GCRs. It seems more likely the GCR flux is variable outside the control of the sun. Which also suggests the Milankovic cycles are not the whole story. Very interesting piece. When taking ice cores, what process is used to delineate/differentiate the oxygen content of individual “layers” to break out estimates of the years that they represent? How thick (or thin) a “slice” of an ice core can be assayed in any given sample and how are variations in thickness/deposition over time accounted for? Given the various warm spikes that occurred over time, what measures can be taken to ensure that melting (not to mention shearing and other physical effects) don’t compromise the dating of the analytical measurements. Are you copmparing that with this. We found that although the Gaspe series begins in 1404, up until 1421, it is based on only one tree. Where were the Greenland ‘Greenies’ eons ago? The scientific consensus of that day would have dictated the ‘correct’ human inputs and outputs, and the tropical paradise of Greenland could have been preserved. I think that the most northerly place in England where wines is produced from grapevines is Lincoln or so we were told.I hate to think how those vines have fared in the recent cold weather.I planted a grape vine myself and it flourished It produced a large amount of grapes over several years. The height above sea level though as mentioned in this post is probably important but I think that the grape vine is more hardy then some people think particularly those from Germany. Please define “global temperature” as precisely as you can and how to measure it. Also, please provide the reasoning as to why temperature changes in Greenland would be significantly different than in other parts of the world and whether those changes would be more or less dramatic than elsewhere. The reiteration of recorded history, IMHO, is much more convincing than a sampling of ice. Dr. Easterbrook, how does one differentiate the H2O that had froze, then melted, then froze again several more times, from the more simple H20 that maybe only refroze a couple of times? Does melting and refreezing change the isotope configuration? And doesn’t particulate move through ice? I don’t mean to be a wet blanket, but its hard for me to wrap my head around the dating and the isotope ratio stuff. That said, if it is consistent with recorded history, then it would be a powerful correlation. Thanks for the posting! I’m having a hard time trying to understand how Oxygen transmutes from one atomic weight to another just based on Temperature. Are they measuring actual atmospheric O2 trapped in the ice along with the trapped CO2 ? Or are they measuring the Oxygen in the H2O molecules of the ice itself and what about the Oxygen in the entrapped CO2. I would think they could get C18O16O, along with C18O2, or C16O2, and then there’s the H2 or D2 or maybe HD in the water. I really don’t understand how Temperature can affect the atomic weight of an atom species. I have to disagree with the concept that Greenland ice cores can be a valid proxy on their own for global temperature. While it may be a good indicator, the full picture can only be seen with an attendant show of comparable antarctic ice cores. Maybe I’m arguing for what will result in only a degree of accuracy, but I believe it better to withstand opposition. What happens on both poles, not just one, is a better perspective of the globe as a whole. Bearing in mind that 2010 has tied for the warmest year on record with 1998 (See http://www.drroyspencer.com/2011/01/dec-2010-uah-global-temperature-update-0-18-deg-c/), can you please explain when you expect this global cooling to begin? Many years ago I lived in the South of France, but some distance from the sea. Hard frosts were common in the winter, but the vines didn’t mind. I was told that the vines are quite hardy to frost but what is crucial is the amount of warmth and sunshine they get in summer to produce the necessary sugars. So cold winters are ok but cool summers mean you don’t get much wine. And….kind of political question: what does come next? How accurate is ice core record dating? From the article, one could assume that dust layers are used to indicate annual boundaries. Is it not possible that ice layers might not be formed for decades, centuries, or millenia during warmer periods? If so, there would appear to be large jumps in global temperature. Is a secondary method like carbon dating used to verify core age? Given that global temperatures have not increased for the past twelve years (now over 1/3 of a “climate cycle” of 30 years – while CO2 has steadily increased, when will (anthropogenic) global warming begin? Given that temperatures rose equally fast for equally as long between 1890 and 1940 – when CO2 was steady at 280 ppm – when will CO2 begin affecting global temperatures? Given that CO2 was rising while temperatures decreased for 33 years between 1940 and 1973, when will CO2 begin affecting global temperatures? All I can find is a 350 year natural climb up from the Little Ice Age, combined with a natural 66 year cycle that peaked 2000 – 2010. Yes, we are now in a (naturally-occurring) flat spot of warm temperatures from 1998 – through 2031. then we (might) rise again for 33 years. Or we might have peaked the Modern Warming Period today, and already be sliding back down into the hazards and death of the Modern Ice Age. And hopefully, NOT the next Modern Glacier Age. Which is overdue. In Roman times grapes were grown as far up as parts of the North of England. In the latter half of the 20th century vineyards were established in the south of England and later in the midlands. English sparkling wines and particularly those grown on chalk, similar to champagne region of France, have won many awards over champagne in France and are a normal feature in Royal banquets – particularly when entertaining foreign heads of state. Does this mean that you think the Russian heatwave, Pakistan flood, Australian drought and flood (all of which may have contributed to food shortages) are as a result of global cooling? They are measuring the depletion in the ice of the heavier isotope from a sea water standard. Multiple cycles of evaporation/condensation in route from the equator to Greenland fractionates the lighter from the heavier. They are not measuring changes in the trapped air. http://www.kidswincom.net/climate.pdf. So why do global temperatures change? Is there some model that explains the changes? Instead of just arguing that CO2 is not the primary driver of global temperature, it would be nice is there was a competing model that explained temperature with CO2 in its proper role. For those that say that “global temperature” is a meaningless term, when we say the Earth is experiencing an “ice age” are not we implying that the Earth is much cooler than at other times? Perhaps we cannot measure global temperature in an absolute sense, but surly we can speak of relative temperatures. O16 and O18 are natural isotopes of oxygen. Water containing O18 has different boiling and freezing temperatures than normal O16-Water. The differences in vapor and snow depend on temperatures during evaporation of water from the sea and condensation to snow. It is absolute rubish to attribute delta-18O to temperature. As a part of my Ice Core series, I have produced a page explaining exactly why. Basically, Vostok data for the last 420,000 years shows 4 interglacials using deuterium data, and 11 using delta-18O data. This discrepancy proves that one of these proxies is NOT a temperature proxy. As always, please obtain and plot this data yourself. In science, don’t trust anything that can not be replicated. Absolutely correct, it is. The IPCC has been using the Greenland ice cores temperatures and calling them global for years. Does that mean you believe a minor trace gas is the cause? Such natural fluctuations have always happened. They are the result of natural climate variability. Nothing out of the ordinary is happening. Very nice. Thanks for the post. Will this info be published? Louise, you’re trolling. Heatwaves in summer in Russia are common; Monsoon rains in Pakistan as well (i read that in this Monsoon season 5% more rain came down than usual; the problem was more with the dykes it seems). Australia *always* has drought or flood. I don’t know about vines growing in northern England, but here in southern Scotland, on the Solway coast, I do know that since the early 1990’s I have left my dahlias to overwinter with impunity. Never a one was lost as a result of frost. Last winter and again this winter, the frosts were so severe and of such duration that every tuber turned to a suparating mush, and yet again I must replace them at some considerable cost. Causality? Laziness, rather than a damascene conversion to the Global church of Disruption. Perhaps Louise and the other two trolls above would like to explain when they expect this global warming to begin, or are they just parroting the discredited psuedo- science of the team? Should I lift and store my dahlias this autumn? What do you think? *** You seem to assume that the relationship of Greenland icecap temperature to global temperature is a constant across all climate states. That is wrong. If it were right, then we could measure today’s global temperature with one reading at one location and extrapolate to the global. but the noise at each location causes it’s temperature to move differently from other locations. Here is the simplest and most telling point. At the glacial maximum, the sheer presence of the huge ice sheets (predominately in the NH) and the global drop in sea level by ~120 meters caused wind circulation to be different from today. To expect the pattern of temperatures around the world to remain constant under such a massive difference is folly. GregL try reading the article. To ask the question in a different way: Is it assumed that there were no periods of melting or no ice formation in Greenland over the period that the ice cores represent? If there were such periods, would these periods appear as abrupt changes in global temperature? If there was no ice formed during these periods, how do we know how long they were? Doesn’t this cast doubt on the utility of the ice record? Of course that would be a stretch. That is why this articile does nothing of the sort. It presents the Greenland temperatures based on ice cores, and then correlates that with the history of other climate trends in the rest of the world. True, the Greenland ice cap doesn’t tell us about the Nile freezing (etc. ), but the Greenland ice cap record fits in with much of the rest of the climate record throughout history. The geologists perspective is valuable in confirming that what we see happening today is nothing unusual. I want to point readers towards an explanation of the 27-30 year cycle of temperature in the Greenland ice core that continues to this day. It is a hemisphere wide phenomenon. This explanation focuses on the swings in the Arctic Oscillation. In its simplest and most meaningful definition the Arctic Oscillation involves a thirty year decline in atmospheric pressure in the Arctic followed by a thirty year increase. As pressure increases the westerlies that ‘prevail’ in the mid latitudes stop ‘prevailing’ along with the trade winds. The polar easterlies become more evident. More frequent ‘Arctic Outbreaks occur’ in winter affecting all landmasses in the northern hemisphere. The temperature of the northern hemisphere and the Arctic in particular follows this cycle as is evident in surface temperature data. The notion of man caused warming is not based on science and one can not fight it with science. Superstition and fakery is what it is all about and it is actively promoted in our educational institutions. It is the new state religion. People make money out of it and it makes them feel ‘holier’. Its the most recent manifestation of the ‘crusade’. So, many people feel a lot better if they support this thing. You wont take that away from them easily. You need something else to replace it. CET, Loehle 2008, GISP2 are the best antidote against any hockey stick. 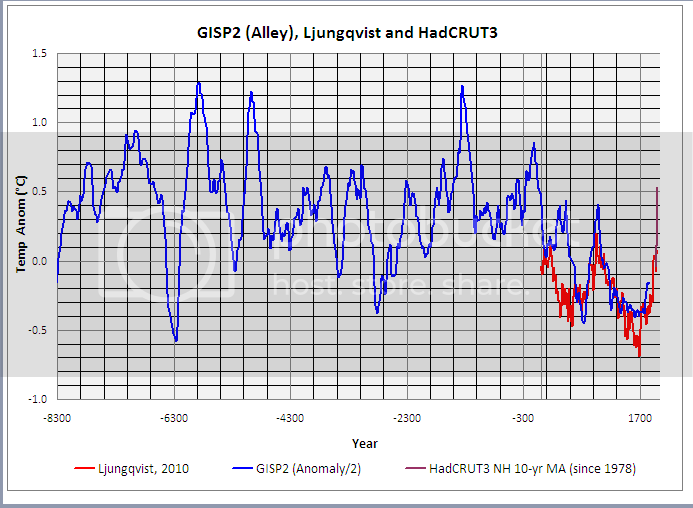 Keep in mind that GISP2 ends in 1905, but it is a good proxy for North Atlantic/NH. This is an easy-to-understand piece of information. Can’t we send it out to all those hyper-ventilating governments? we have 200 years of Co2 chemical bottle data that show that CO2 has fluctuated greatly, above 440 ppm and up to 550 at times during three periods of the last 200 years. The 280 ppm is from ice cores that are reputedly 30-50% off from the real values. These cores are traumatized during extraction. If the 30-50% error is corrected, it puts values right in the range and even higher than today – the same range as the bottle data show. This correct has been shown valid by other means as well. It is the IPCC which unilaterally discounted all bottle data except for two French papers which used a terrible sulfuric acid methods which is known to produce low values. The temperature of the oceans drives the CO2 level. Alarmists standardly over-estimate our contribution and claim a 200-1000 year half-life for CO2 when the real value is more like 3-15 years. The published average is 5.4 years – this is a totally difference value but does reflect the fact that monthly CO2 data currently shows seasonal changes which should not be seen if the half-life was what the alarmists claim. the global temperature anomaly has now gone negative,wiping out all of last year’s ‘warmest year ever,second warmest year ever,etc. I think that the global climate is beginning to cool because of the ocean cycles and the low solar activity etc. I have never thought that level of co2 in the atmosphere has much to do with global temperature.We were being told last January by warmists that last years El Nino would make 2010 much higher than 1998, this did not happen,yet we are still hearing your claims that world temperatures are on a rising trend,they are not and they are more likely falling. A general “rule of thumb,” when using polar ice core temperature series as global proxies, is to use one-half of the amplitude of the ice core temperature anomaly series. By atttenuating the GISP2 amplitude, you can tie it into northern hemisphere temperature reconstructions. The magnitude and rate of warming shown by the instrumental record (HadCRUT3) is not anomalous when compared to the attenuated GISP2 record. Also, bear in mind that the instrumental data have a much higher resolution than the proxy data. The amplitude of lower resolution data will almost always be attenuated relative to higher resolution data. Dr. Don J. Easterbrook thank you! Every human civilisation in human history has believed that its actions can affect the weather, our civilisation is no different. When our lives as hunter gatherers depended on understanding the weather and the pattern of the seasons, such a superstition was useful, and ensured our species would survive and prosper. This is who we are. But I haven’t seen many human hunter gatherers lately, so perhaps we should dispose of such beliefs as no longer relevant. The recent NGRIP d18O temperatures come up to 1980. As Louise is quite happy to call Dr Easterbrook names, then I am sure that she will not mind if I call her a Troll. It is the most polite name I can find for her. I would add to that name, the adjective gullible. Funny how weather can become climate in an instant when gullible trolls are involved. Following the last news from the Himalayas by the IPCC the amount of stones in the glaciers is disrupting , slowing down the melting of the glaciers ……..This is rockhard proof of global warming , the stones are telling the story here . It is a relief for Mr. Pachauri that he is no longer between a rock and a hard place and the deniers must be stone-deaf not understanding his supernatural logic . Throwing precious stones at his most esteemed and dignified robust papers is a barbaric act showing a lack of compassion for the mind-set of the enlightened part of the population and may only lead to more voodoo and further warming of the climate . Just curious. Is it any more of a stretch than using tree rings from one tree on one mountain as global temperature? I’m really sorry to make my post offtopic but I’ve just got back home, turned on BBC 2 and there is a show on called – Horizon, Science under attack by Nobel Peace Prize Winner Sir Paul Nurse. First 5 minutes, it is a massive hit piece, asking the public to back off from “prosecuting” or questioning the science consensus that is Climate Change! I’m really shocked at the blatant propaganda here, they are assuming that it is the public that are merely skeptical, not experts such as yourself Anthony and many others that post very well written and technical information for a wider audience. It’s been a while coming but this being on prime time televesion in the uk; I feel it is a massive step at trying to shut down the skeptic movement by marginalising us into the Public (“non-experts”) v The Climate Scientists (“experts”). 10Be concentration is a function of both production rate and snow accumulation rate. The higher Pleistocene values are due to lower accumulation rates. I’m not sure about the Younger Dryas peak but I suspect it is the same reason, if it were caused by solar activity or a geomagnetic excursion then it would be a global signal. Prof. Easterbrook, thank you for you clearly written, non-alarmist and jargon free paper. I would expect that there is a comparable project looking at cores from Antarctica. If so, is there a paper that is comparable to your post that you can recommend to WUWT readers? What kind of comparisons between GISP2 and Antarctic ice cores are there in the archival literature and has anyone published summaries that are aimed at the non-specialist reader? The first graph has temperature in Centigrade and resolves time to around ~300 years. 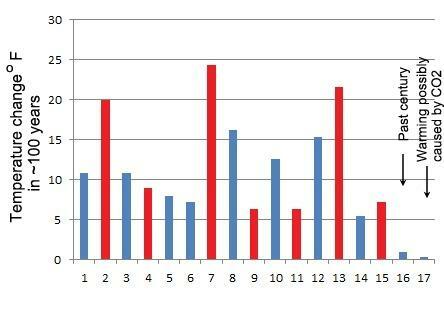 The second histogram of rates of temperature change is in Farenheit and seems to be labeled ‘per hundred years’. Unless my conversion of C to F is way out the maximum change in the top graph (per 300 years) would not give the maximum rate shown in the histogram. Perhaps you meant per THOUSAND years ? Is there evidence the cooling event at ~ 8200years ago is reflected in global records? An interesting feature of the historical data is that the natural climate swings during interglacials are smaller than those during glacial epochs. I have attempted to explain that by proposing that the two main climate drivers are solar variability and oceanic variability sometimes acting together and sometimes offsetting one another. Solar changes appear to operate not by simple changes in TSI which are negligible but rather by changes in the mix of wavelengths and particle types arriving from the sun which then cause amplifying chemical changes in the atmosphere so as to alter the vertical temperature profile and redistribute surface pressure so as to increase or decrease global cloudiness and albedo by making the jetstreams more or less meridional/zonal. Oceanic changes involve variability in the rate of energy release from oceans to air on multiple timescales. There is ENSO then PDO and I also suspect a further 1000 to 1500 year cycling linked to the thermohaline circulation. My proposition is that interglacials occur when the solar and oceanic effects are broadly offsetting one another to minimise climate swings. Ice ages occur when the solar and oceanic effects are broadly supplementing each other to maximise climate swings. The long ice ages and short interglacials being a reflection of current landmass distributions. That is not to deny the effect of Milankovitch’s findings. I merely suggest that those shorter term solar and oceanic effects are superimposed on the longer term astronomical cycles. And it is the extremely rapid swings in temperature that lead me to believe that orbital mechanics isn’t what is the main factor here. Something else is going one. One doesn’t wake up one morning to discover that the Earth’s orientation in space is completely different than it was the day before. In my other reading, most of the initial jump in temperature of the initial warm pulse coming out of the last glaciation happened within 5 years with the majority of that happening in one year as shown by layers of dust in the ice cores allowing one to see annual ice deposition. It seems that our slide into glaciation is itself gradual but during that gradual overall slide, there are still extreme variations that occur. 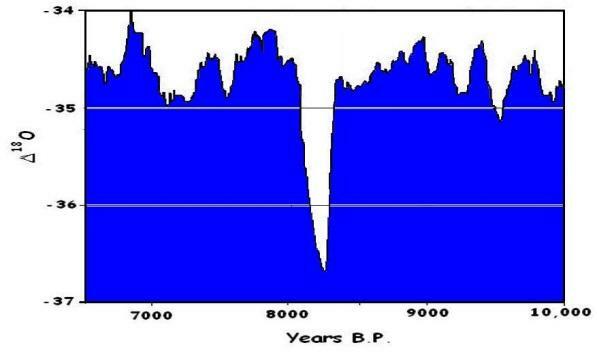 Also, looking at Figure 1, it would seem that we are just about ready to slip back into the “blue” zone of the graph for another 100,000 years or so of glacial conditions. One “Bond Event” and we might tip the balance. If one believes that the LIA was the last such “Bond Event”, we should be due for the next one in about 700 years or so (figuring the last one happened in the early 13th century and the events are roughly 1500 years apart). Something drastic happens. I don’t think we have a clue what that something is yet. I suggest that what happens is a period of solar and oceanic cycles supplementing each other for a while instead of offsetting one another. i) For extreme cooling of the troposphere – A positive AO allowing faster energy loss from air to space (caused by an active sun) plus a negative PDO. Thus energy being denied to the air from both above and below. ii) For extreme warming of the troposphere – A negative AO reducing the rate of energy loss to space (caused by an inactive sun) plus a positive PDO. Thus energy being added to the air from both above and below. During the late 20th century we had an intermediate scenario of modest warming (active sun for a positive AO and a positive PDO) and at present we have an intermediate scenario of modest cooling (inactive sun for a negative AO and a negative PDO). I do accept that any readers who are unfamiliar with my work will have a problem following the logic of the above but c’est la vie. I’m putting it up here and now for future reference when (or if) my work becomes validated by events. The nadir of the last Bond Event was ~1600 AD. The Pleistocene Dansgaard-Oeschger events in the Greenland ice cores had a period of ~1,470 yrs (+/-150 yrs). Bond described the Holocene version of the D-O events (Bond events) as having a period of ~1,470 (+/-500 yrs). I think that most of the Bond events in the GISP2 core and in the Moberg and Ljunqvist reconstructions appear to have a period of about 900 to 1,000 yrs. The -500 part of the +/-500 yr variability seems to be the norm. If that’s the case, the peak of the modern warming will occur within the next 100 years and we will start sliding down toward the next Bond event nadir. The secular trend since the Holocene Climatic Optimum has been negative – So the next Bond event will probably be colder than the LIA. It would seem you have not been paying attention to the lack of warming for the past nine years. Silly rabbit. Really old ice cores must be taken at the ice divide at the middle of the Greenland Ice Cap. That means that the snow falls at about 2000-3000 meters altitude where temperatures practically never rises above zero even in summer. The risk that an entire years’ snow-fall would melt is zero. As for dating the cores, for the last several thousand years one can simply count the annual layers. At greater depth the layers become so compressed that they are not discernible. Here it is no longer possible to measure single layers and the dating becomes more problematic. Volcanic ash layers can be used to correlate and in some cases date the ice. Geomagnetic excursions can be used in the same way (they can be discerned in the ice by the isotopes created by increasing cosmic radiation). However it should be understood that in the lower part of the Greenland ice-cores the dating uncertainty can be as large as a couple of thousand years. Another uncertainty is due to the fact that the thickness of the icecap has certainly varied over time. This means that at times when the cap is thicker, the snow falls at a higher altitude and will give a colder temperature. The temperature is of course correct, but not quite comparable to results at times when the ice-cap was thinner. This problem can be to some extent corrected for by comparison with the core from the small Renland icecap, that can for topographic reasons not have varied much in altitude. I had to read that three times to make sure I understood . Could you imagine the wailing and gnashing of teeth if that occurred today. Sorry, that’s just not true. There are many vineyards in England. The house I grew up in had a grape vine crawling up the south side when we moved in in 1970. It was many years old and well established. No. There has been special studies made of the younger Dryas interval with much denser sampling than the main analysis series. Those big changes in temperature really happened in a few decades. Perhaps even less as they are at the limit of what can be discerned at that time-depth. The Younger Dryas was synchronous and is easily discernible all over the Northern Hemisphere and into the southern tropics (e. g. Lake Malawi). It is not discernible at higher southern latitudes, and in Antarctica it was actually a warm period. This seems to be something of a rule – cold intervals in the Greenland cores are often mild in Antarctica. Again as for Younger Dryas, the “8.2 KA Event” is found all over the northern hemisphere. Thank you Dr. Don for an article that can only be seen, by me, as confirmation of all that I so far have taken to be facts about climate history. It also adds a lot “extra” to my knowledge. Your graph showing temperature during “The Holocene interglacial and Last Ice Age” does show quite clearly what I have been seeing, in other similar graphs for a long time, which is that “The Holocene” has gradually and steadily been cooling during the past 8 – 9 thousand years, and that we are now at ”the threshold” of what might very well be the next big freeze. Back, when I was a young lad, in the early to mid 1950es, Scandinavian scientist (and probably others too) had increasingly, as the world cooled, got more and more fed up, or disillusioned, with the “late and great” Arrhenius and his idea that a substantial increase in “atmospheric CO2 would/could prevent the advent of another Ice-Age. Instead they started to re-examine the Milankovitch cycles. My science teacher, at the time told us (or his class): “Scientists are now insisting that Ice Ages are, most likely, being brought on by a change in the Earth’s track around the Sun. However as summers in the Northern Hemisphere take place when the Earth, in it’s track, is as far away from the Sun as it can be, it seems logical to me that if this circuit becomes more elliptical summer in both hemispheres may get cooler yes – but – winters would equally get warmer or to say it in a different way, average energy received from the Sun would stay the same. I can add many other reasons as to why the Milankovitch cycles are not the end all and be all for the comings and goings of Ice Ages. – What, for example, is it in the Milankovitch theory that decides the length of “Interglacials”? Practically all matters that have been raised on this thread are explained there. And, yes, Dansgaard-Oeschger events are named after him. Thank you for your response. So the ice core record is asumed to be continuous over the last glacial period and so far in this interglacial. Known-date volcanic ash markers and geomagnetic information correlate well with this assumption. Hmmm… Methinks Dr Easterbrook missed Alley et al 2010. He’s completely missed antiphased events or any local disturbances (ice flows, etc) that are present in the GISP2 data. Nor does he seem to understand that GISP2 is a local record of temperature and implying that it is a global proxy rather than the single site record that it actually is. Fred, thanks for the explanation. When you use the word “fractionate” then I presume you are using it in the same sense that chemical processing plants; refineries for example have these fractionation columns, that separate slightly different molecules, in a continuous recirculatingg process that slowly dides the two species. Similar concept to the centrifugal separation of Uranium isotopes; well hell milk separators work the same way. So just what Temperature does the resultant isotope ratio proxy; the tropical oceanic source Temperature, or the snow deposition Temperature. It sounds like it is complicated to calibrate; unless I am just not grasping the whole process. But researchers seem to feel it is a robust methodology ? Actually that is not true. GISP2 is dated to “0.095 years before present” but Dr Alley states that YBP is the standard 1950 used for radiometric dating. That means the data ends around 1855. I take offense to ignorant folks degrading the noble Crusades. The political religion pushing their agenda (21) and earth charter more closely resemble a Jihad, with ‘climate reparations’ resembling global Jizya. I personally don’t care if the Maldives is flooded. But it STILL hasn’t happened despite tourists being secretly insulted during their marriage ceremony. There is so much evidence that we have been lied to that I can only surmise that those people who are awaiting the ‘age of aquarius’ by ocean flood want it to happen to prove their faith in progressive religion is not in vain. Uh oh. Isn’t a half mile thick continental glacier considered a flood? You just have to marvel at people who put all of their faith in big government science. Because government is always trustworthy (lol). Uh no. The fact that ice cores appear to show this in no way supports the idea that CO2 levels were consistent or that low for extended periods. For the regrowth of vegetation after extreme cooling periods and their survival during those periods it is simply unlikely. Yes I know that in the Northern hemisphere there are sedimentry records with very good resolution for the Younger Dryas that show a big temperature change in a few years, perhaps less than a decade. But as you concede later in your post the this was not global. Perhaps I am misreading it, but I cannot reconcile that with the temperature change from the GISP data. But it was not the YD that causes me tyhe most problems with the graph. The end of the ice-age AFTER the YD was slower, taking at least 1000 years for the global temperature to rise by ~16degC. I am unable to reconcile that with a histogram that appears to show a rate of warming of 24degF ~100 years. It seems to be an order of magnitude out. I lived in the Midlands in the 70s and my parents had a number of vines growing against a south facing wall some of which were trailed into a sunlounge. There were a couple 0f good summers in the 70s and in those years I made about 80 bottles (+/-) of very pleasant white wine. Too many points to put here, just go and read the article! There are wine grapes grown in England. The question is how far north they used to grow them. Wonderful post and more the pity that some posters just do not read it. A lot of complaints about is it a true proxy, is it global whilst ignoring what was clearly written. I find the historical parallels fascinating. The MWP lead to a population explosion on the Mongolian Steppes, resulting in Ghengis Khan And his sweeps across the world. The ending being so sudden and catastrophic enhanced his ravages by6 weakening the civilisations he ravaged. Even more interesting was the Egyptian Dark Ages, Again bought on by cold, the Nile freezing and Invasion by Assyrians, Persians and Greeks. All well know records that confirm the proxy data. Going back further, we see that in the context of change, the Younger Dryas was really a paradigm shift in climate, a massive swing. However, the World recovered but clearly in a range of cycles that seemed to have worked themselves out. If the YD was caused by an astronomical event it may be possible to calculate both the cause and effect of the subsequent cycles. The 540 event also needs to be pinned down as its place in history is perhaps even more important than the Mongol Hordes. It finished off the roman Empire, turned the Isles of the Blessed into the British Isles and set the stage for a future global event. In China it resulted in Fragmentation and disorder again. All of these events were triggered by changes both greater than what we see today and amongst societies far less able to cope with or understand the changes. Alternatively, if you take the Dark Ages cooling circa 500 AD as the last Bond Event (as EM Smith does) then we can expect the next one much sooner. Easterbrook is well aware that the GISP site is a dot on the map. He is testing the correlation between the GISP temperature records and historical events that all took place in the northern hemisphere. He makes a good case. He also points out that these same historical events cannot plausibly be attributed to variations in atmospheric CO2 concentrations. You are right about one thing. The GISP record ends in 1855 rather than 1905. Ah Louise, if 2010 is tied for highest temperature with 1998, that means no increase in temperature for 12 years so where is the warming trend? No they dont, its just a ratio and that does not effect the trend or range. Its far more accurate along with historical supporting data than a lonesome pine taken out of context. Greg cant you read history, tells you greater changes then were a fact of life with dramatic effects. Todays are minor and we are far more able to cope with it. I’m happy to see a skeptic including some real data. I do have a few questions, though. First, how many people who are “skeptical” of global warming own real estate in Canada (because that might indicate a conflict of interest). Second, how many people live near sea level today compared with 8200 years ago, when we had the last big warming event. Third, if atmospheric carbon dioxide concentrations do not correlate with previous rapid warming events (which means that there are other things that affect global climate change) and they do correlate with our most recent general warming trend, doesn’t that fail to eliminate carbon dioxide as a primary cause of warming (or cooling)? It seems like this analysis is working from the assumption that carbon dioxide is either the only factor or it is not a factor at all, which seems illogical. Isn’t it possible that it can be one factor among many? I wrote a comment earlier today, but lost it. Just as well. I don’t how to say what I want to say. I want to thank Don Easterbrook for clarity of presentation re the silliness of demon-CO2. And I commend a fine summary statement of the research I have been reading about now for many months. I have a however, however. And I also hope that my however does not sound like a mean-spirited critic. 1) Are ice cores truly proxies? 2) Is Greenland good enough to stand for global temperaturs? 3) What is a global temperature anywa?, This is sounding like a mythology to me. When I read the comments, it seems like many individuals (mostly scientists, I assume) are critiquing the mythology, but no one has put together another hypothesis that can be turned into a theory and tested experimentally. I wish you all well. I very much enjoy the read and the debate. Best peer review I can imagine. Anthony, tips and notes contribution here — why not a peer reviewed issue of your interest that gets followed up in minute detail? These posts are almost that, but the analysis from post to post is not precise enough for a particular issue. You would need someone among your amazing, commited colleagues to sumamrize the main points and direct the next poster to elaborate on those. I would even try in my limited way to follow the math. The equation in the second seems a touch odd with the multiplier of 1000 applying only to the second ratio. Left me wondering whether a couple of brackets had been omitted – allowing the multiplier to apply to both terms in the top line. Thanks, Dr. Easterbrook, excellent post! The coments are almost all very good too; this is in no small part thanks to Anthony and his moderators. I come here to learn, WUWT never disappoints me. I’m happy to see a skeptic including some real data…..(<—-huh? )………It seems like this analysis is working from the assumption that carbon dioxide is either the only factor or it is not a factor at all, which seems illogical. Isn’t it possible that it can be one factor among many? Well, its possible. Many think so. Here’s a recent post salient to your question. Be sure to click on E.M’s link at the top and go to his site. He’s got some posts with some real data. We should remember that as the last Glacial ended, the sea level began a rise of 120m. At some point, the Pacific Ocean breached the Bering land bridge, which would have resulted in dramatic climatic changes. Also there were dramatic floods when dams which were holding back vast lakes created as the ice sheets melted failed. The resulting cold water pulses in the oceans surely had substantial climatic effects as well. The Black Sea was much shallower during the Glacial as it had no connection to the Mediterranean at the time. Maybe someone knows if there is a correlation between these events & the sudden changes in temperature indicated by the GISP2 data? I think the primary problem is that the AGW people want to take the “what else can it be?” approach to contemporary warming. In other words, they are claiming that they have evaluated all the things that can effect temperature and they cannot point to anything that is causing todays warming, so, “what else can it be?” other than CO2. But, as all the evidence shows, the current climate models could never account for the drastic, short interval changes that have happened in the past. Those changes tell us clearly that we do not understand natural variability enough to make a “what else could it be” kind of statement. So, yes, we can likely attribute some of the warming to CO2. But the argument that most of the warming is attributable to CO2 and that we will get 3C of temperature increase per CO2 doubling is simply a fiction. It’s very simple Aaron, there is no basis for declaring CO2 an imminent danger to the world. Hansen went off the cliff and too many climate scientists followed him. Having done so, they were well rewarded with research grants. Now they are stuck in a paradigm that they can’t afford to let go. mods – I did not call Dr Easterbrook a fraud. I asked him to show how he rebutted the accusation of fraud made elsewhere. I see that calling Hansen, Mann and Jones frauds is perfectly OK on this board? As I expect my denial of accusing Dr Easterbrook of being ‘f….’ to get stuck in moderation I will repeat it here without using that word. I did not call him anything. I asked him to point to where his rebuttal of others accusations of this would be. Not posting my comment yet accusing me of calling him something rude is clearly designed to denigrate me. It is not true. I did not call him names. Couple of posts refer to 10Be concentration. My brief research into 10Be records shows an ambiguous situation during the last 350+ years, concluding that 10Be records from the Greenland ice cores cannot be relied from. Only reliable 10Be data are those from 1970’s onwards obtained by satellite detection. The Geology Faculty at WWU believes that all science must be subjected to rigorous peer review and publication before it becomes worthy of serious discussion. We do not support publication of non-peer-reviewed scientific results in the general media. A brief guide to peer review is available at Sense About Science. So you propose that the younger dryas was a local phenomenon? Interesting theory. I wonder if you can back that up with anything? Another nail in the coffin for “unprecedented warming”. A recurring argument from the AGW crowd is that all changes in the past was slow and attributed to Milankovitch cycles and other slow orbital changes, as opposed to the modern “rapid” warming. This is clearly a baseless argument when looking at the paleoclimatic record. Thanks Don, this is a great example of how temperatures move rapidly up and down without apparent trend. Our climate system is driven by deterministic chaos and their is no need to resort to pixie dust (CO2) to explain the historic changes seen. Predictions about the future direction of global climate will continue to fail until this simple fact is recognised and the tools are developed to understand dynamic non-linear systems. Several people on this thread have been having a go at Louise, who seems to have little grasp about how climate oscillates. She has obviously been brainwashed by the CAGW alarmist campaign and arguing against such personal belief is a complete waste of time. Louise, unlike the previous three decades, the last decade has shown no warming for a decade, this clearly shows a trend in the trend towards cooling – in other words a turning point (or in language warmers will understand the “top of the curve”. Louise, I wouldn’t take it personally. Most of the posts that get snipped are over enthusiastic sceptics who make personal comments regarding climate “scientists” … I’ve probably had some of my own moderated!! Further, perhaps Louise could enlighten us as to how the CO2 levels of less than 300ppm (current level of over 280ppm) caused the great floods (3 of them) of 1893 in Brisbane, where the Brisbane River reached heights GREATER than that reached this year (2011)? At the same time she could also enlighten us about what the term “Monsoon Season” means, and how Queensland currently being in the first month of a three month long season would affect rainfall levels, and further why that season has existed since Brisbane was settled (in 1842). This was covered earlier in the thread. Do I take it nobody bothered to read the WWU Geology Department’s January 2011 ‘Positions on Current Issues of Geological Relevance’ statement I posted above. You really should, you know. Or just Google it. And Brian of Moorabbin leaves out the detail that in the early eighties, as a response to the 1974 flood, the Queensland government completed another giant dam – Wivenhoe – to mitigate against the repetition of just such an event. Therefore flood marker heights don’t really tell the story of the volume of the water involved in this event, do they? I’m sure the current inquiry into the floods will resolve these matters, but this measure simply doesn’t tell the whole story. The catastrophic flash-flooding at Toowoomba and in the Lockyer Valley is utterly unprecedented – which is why everyone was caught by surprise. Ditto the current flooding in the southern state of Victoria, affecting 1/3rd of the state and officially the largest such event in the state’s history. And ‘monsoon season’ can’t apply in the temperate south. And to forestall the other piece of misinformation doing the rounds the Wivenhoe dam was not ‘full’ shortly before the flooding, therefore meaning it made no difference to the flow into Brisbane. Drinking water capacity may have been around 100%, but because of it’s dual function this dam has a maximum 200-220% capacity. It reached 187%, even with large volumes of water having to be released, which was necessary because at 190% the dam essentially breaches and begins to spill uncontrollably. Unfortunately the error remains in the histogram that purports to show rates of warming of the glacial/interstadial changes and the recent warming. The figures of 24degF ~100 years are clearly wrong for the global warming that ended the last ice age. They are out by a factor of about ten. 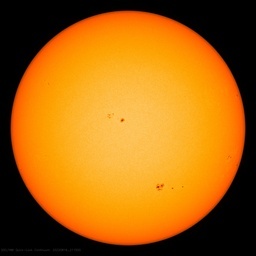 Which puts them in the same range as the rate of warming seen during the last century from solar changes and CO2 rise. have you considered? said: “Ditto the current flooding in the southern state of Victoria, affecting 1/3rd of the state and officially the largest such event in the state’s history”. How long have people been recording weather data in Australia … not very long … have you considered that? Why don’t you take a look at the data? Here is the relevant time interval from Alley, R.B.. 2004. Data Contribution Series #2004-013. NOAA/NGDC Paleoclimatology Program, Boulder CO, USA. The first figure is the age in thousand years before present (1950), the second is temperature. The change is about 10.7 degrees C. (19 deg F) in 160 years or about 7 degrees C per century, peak rate in the middle of the transition is well over 10 degrees C per century. That is nearly 8 degreees in 140 years, or about 5.5 (10) degrees per century. Also pretty sudden. There hasn’t been a really wet season since the City of Toowoomba turned those two unseemly sandy dry river beds in the middle of the town into parks and parking lots. So, yes, it was “unprecedented”. Somehow I doubt that those parks will ever be rebuilt. These D/O events are something to really worry about. They indicate to me some kind of major ocean and/or atmospheric circulation change. The Gulf stream migrating south and pushing most of its flow east, then south along the southern European/northern African coasts would be my candidate. The North Atlantic and Barents Sea would chill dramatically & the sea-ice edge move southward. Not good, particularly for northern Europe. If it occurs during the waning period of an interglacial (like now), it might even tip the balance to a new glacial period. In fact, glacial periods may just be the result of these ocean-changes becoming the “rule”. How’s that for a tipping point? The point Aaron is that, according to data from ice cores, they did correlate. Every time the Earth entered a new ‘interglacial’ or warm period, the Earth warmed first and then some time later, atmospheric CO2 started rising too. The “warmists” acknowledge this as fact as there is no other way round it. However they then go on to insist that at some time CO2 started “to take over the global warming”. This insistence is in spite of the fact that there seems not to be any “crossover point” in the two graph lines of CO2 and temperatures. Furthermore, again according to ice core graphs, levels of CO2 stayed high in the atmosphere, on all occasions, long after the temperature started to fall back and the Earth once again entered into a new glaciation. “Why don’t you take a look at the data? Here is the relevant time interval from Alley, R.B.. 2004. LAST UPDATE: Released 27 November 2006, received by WDC Paleo 12/2006. See complete list of contributors in the reference list below. Column 3: NGRIP d18O (permille) resampled to the GICC05 time scale. Column 5: GRIP d18O (permille) resampled to the GICC05 time scale. Note that the indicator of temperature does NOT show the large variation you find in your data source, and I can find no period when the d18O (permille) measure showed a change of 10. You have to go back to the depths of the last ice age around 30,000 years ago to find the d18) value varying by around 5 over a couple of centuries. Which brings me to my final point about your post. The column you have labeled ‘temperature’ that varies from -46.8731 to -36.152 is NOT temperature, it is the oxygen18 isotope ratio. There is not a simple conversion of d18O values to temperature because it is dependent on factors other than temperature including the relative partitioning of water between oceans and ice. As any period where there is a large temperature change is also coincident with rapid melt (12m sea level rise during that time?) then the conversion factor will change over that period. I STILL cannot get 24degF ~100 years from a global warming that took over a thousand years to warm ~8degC. You would have to cherry-pick a short period of a decade or two when the change was ~2.4degF per decade and extrapolate it out. However such a decadel rate is not as implied by the histogram so very different from present rates of warming. Extrapolating then for the thousand year plus period of warming at the end of the last glacial maximum that would give a temperature rise of 240degF total. This would be ridiculous for present warming rates, and it is for past rates. As far as I know there is no evidence that the water on Greenland went from frozen to boiling. Why, yes I had. But this is, of course, the only direct data we have. For both sides of any debate. Yep, it was all that car park that did it! And this explains what happened out at, say, Grantham, in open downs country, precisely how? “the Geology Department at the WWU ‘do not support publication of non-peer-reviewed scientific results in the general media’”. What about a ‘White Paper’ or better still a Papal Bull on the subject. Let’s set up an inquisition under the auspices of the United Nations and burn a few skeptics at the stake? What about a stoning or two on prime time TV to make the populace sit up and take notice? Unduly heathen scum. This democracy thing has whiskers on it. ice accumulation data, from the GISP2 ice core, central Greenland. Cuffey and Clow (1997), as presented in Figure 1 of Alley (2000). By the way, you can’t just tack the instrumental temperature record of a certain site to the end of the ice-core record as some people here seem to think. This is because, contrary to popular belief, the ice-core record does not reflect the temperature where the snow fell, but rather where it precipitated in the clouds. This is higher and therefore colder, so there will be an offset. I strongly recommend anybody interested in this subject to read Dansgaards book that I have already referred to, where these things are very well explained. standard deviation to the 0.05 to 0.1 per mil range. -37 BP = 1950 + 37 = 1987. As Richard C says current temperatures are 1.4 – 1.5 C higher, making them the warmest in ~2000 years. Not sure that I can see 4000 years above this current temp in the last 10 000, let alone ‘well over 4000’! Have you considered my two previous posts. GISP2 goes to 1987, not 1855 and recent years are not exceptionally warm in the record, certainly not as warm as the 1930’s and 1940’s. And you can’t just tack the instrumental record onto the ice-core temperatures without an offset. I concide that the older data from just one ice-core does indicate a ~10degC rise in just 160 years, or around 0.7degC/decade. The more recent data from two Greenland cores does not show the same rapid rise. But accepting that the measurements from the GRIP1 do show this rapid rise and the data interpretation is correct, this STILL does not show that the warming globaly at that time was an order of magnitude greater than at present as implied by the histogram. Polar amplification means that temperatures in the Arctic circle have risen by more than the 0.18degC/decade seen over the globe, and the total rise from GRIP from ice-age maximum to Holocene optimum is around twice the global figure. The century when the Grip1 core indicates rapid temperature rise was also a time when sea level rose by ~20metres. Obviously the Greenland ice-cap is smaller now, and the Laurentine ice-cap has gone, but it does indicate that when there is a local polar jump in tempertures as seen at the 11750yrBPE mark the sea level rise can be very rapid as well. Most measures of palaeoclimate provide data on only average annual temperatures, says William Patterson, an isotope chemist at the University of Saskatchewan in Saskatoon, Canada, and lead author of the study1. But molluscs grow continually, and the levels of different oxygen isotopes in their shells vary with the temperature of the water in which they live. The colder the water, the higher the proportion of the heavy oxygen isotope, oxygen-18. The study used 26 shells obtained from sediment cores taken from an Icelandic bay. Because clams typically live from two to nine years, isotope ratios in each of these shells provided a two-to-nine-year window onto the environmental conditions in which they lived. Patterson’s team used a robotic sampling device to shave thin slices from each layer of the shells’ growth bands. These were then fed into a mass spectrometer, which measured the isotopes in each layer. From those, the scientists could calculate the conditions under which each layer formed. They have also found some interesting things re: how fast animals (IE: penguins) adapted to changing conditions in particular their diet: almost completely and (relatively) sudden . . . Setting the 2000-2010 present temperature at -30.15 (1.44 higher than -31.5913 at 1855) shows 12 periods warmer on Don Easterbrooks Fig 5. The 1.44 comes from GRIP data. The major periods total 5790 years. Why is the poster “Have You Considered?” remaining anon? Is he or she part of the faculty of the Geology Dept at WWU? Yes, I have read the disclaimer at the department web page – but felt no need to comment here. So I read it. So what. Why does anyone reading that mean anything to the discussion here? I also minored in Geology at WWU – taking courses and field trips with Don. That also has nothing to do with the discussion of his article. Are you suggesting that Don posted in violation of WWU Geology Department rules? As Don in a Prof Emeritus, is he subject to some alluded to rule that you want us to read? Does the Geology Department think Don should not note that he is on the faculty of WWU? You do not mention that Don was for many years the Dean of the Geology at Western – WWU. Come clean “Have You Considered?”. I posted on NWCitizen about Don’s article – and hopefully have encouraged some of the folks who live in Don’s area to read his full article. Finally – do you wish to state that Don’s article has serious errors in it? If so, say that instead of referring to some authority overseer. And don’t hide behind an anon name.